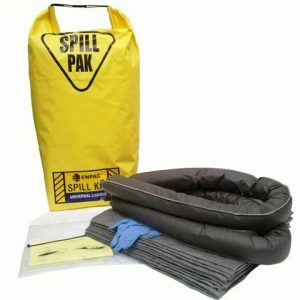 The Deluxe Long Haul Truck Spill Kit can be used as a truck-mounted carrier under semi-trucks/trailers or as a spill response unit in almost any location when mounted to the wall. Mounts easily to trailer undercarriage or walls utilizing molded/slotted holes for multiple mounting options. Contents are safely contained in the lockable ENPAC Poly-Edge which has a durable weather and water resistant gasket seal that keeps all stored items secure and dry. 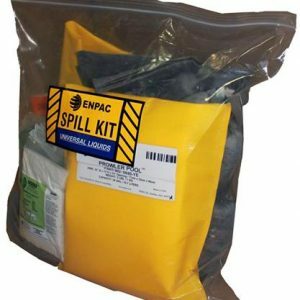 This Deluxe Kit also includes an ENPAC 100 gallon Prowler Pop-Up Pool for immediate spill containment to the widest range of chemicals and a complete Leak Repair Kit. The Kit that is as mobile as you are! Your quick and convenient travel pal for any spill while you’re on the move! Keep it handy in your cab or small enough to store in a toolbox. Also Available in Deluxe. 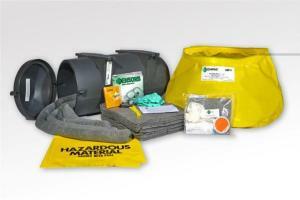 The spill kits contents are contained in a extremely durable water resistant safety yellow Herculite bag. 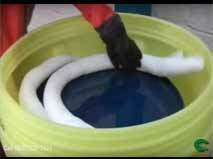 Easily hangs from any piece of heavy equipment such as a forklift.